I take global warming very seriously. It is the perfect example of how our unwillingness to submit ourselves to the laws of Nature has put the world that we create at risk. But I am sorry for the title of Al Gore's book. If, indeed, the word "inconvenient" were found to fit the phenomenon, we would be saying that species extinction, the acidification of the oceans, and an imminent threat to the continuance of human civilization are properly categorized as "causing troubles, difficulties, or discomfort." The stakes are higher than some possible "discomfort." 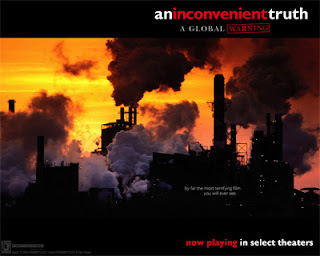 The "inconveniences" we face are the smallest part of the story, if we don't stop burning fossil fuels! Understanding climate change requires going beyond Al Gore and media hype. Climate science is extremely complex, based in statistics and probabilities, rife with uncertainty. The only thing sure is that climate variability is far beyond simple "more CO2 = higher temperatures." Amen, Michael. Stop burning fossil fuels! If you were serious about reducing consumption, you'd staunchly oppose massively unsustainable immigration. As it is, you're pandering to endless millions who come here with 3rd world birthrates and 1st world appetites -- the WORST POSSIBLE COMBINATION from an ecological standpoint. When I call your attention to this atrocity, you get real nervous and change the subject. As a consequence, all your good work is being sacrificed on the altar of endless humanoid population growth. It's uncanny how easily intimidated "greens" are. Pathetic, frankly.